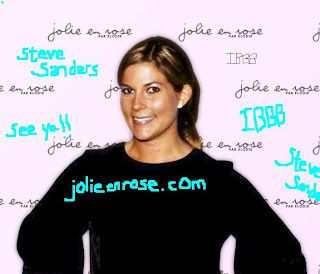 “Operation Sell-Out” continues for IBBB and this time Elodie Otto from “The Hills” has called on me to help me sell her new product line called “Jolie en Rose” (http://www.jolieenrose.com/) which is a great bath and body line that features body lotion, bubble bath, shower gel, and more in some great scents like caramel apple, coconut, cotton candy, rejuvenating mint and more! The price is pretty sweet too and you totally can afford it. Don’t pretend you can’t. If you’re spending $20.00 on 1 martini you can certainly afford this. What better way to support your favorite “The Hills” character who called Heidi “sad” and then said “See Ya!” to her as Heidi and her chin looked confused. Christmas is right around the corner, but don’t wait until then, buy some of this stuff now in time to smear it all over your Thanksgiving turkey. Hey, even your turkey wants to smell nice. Do it for the pilgrims. Do it for the Mayflower. Do it for Elodie. Elodie was also featured in this weeks OK! Magazine and talking about her product line there as well. I like how me and OK! Magazine are on the same level. Similar to “Where’s Waldo” try to find ALL the ways I sold-out in this blog post/advertisement. P.S If you don’t buy these products, I hear you’ll smell like Heidi’s stinky “gentleman greeter” and you don’t want to smell like that, right? P.P.S If you don’t buy these products you are on “Team Steve Sanders” (aka Spencer) and you support terrorism. Good day. An Award Winning Elodie Otto Interview. Screw the "Cram Session." A "Hills" Treat. I Know, I Know. It's "Hills" Day. Why Not Elodie?